A 9-hour drive from Dallas lands you in what is simultaneously the most quintessentially Texas town and the furthest thing from it. Most people have never even heard of Marfa, and even fewer have it on their travel bucket list, but between the art, food, and desert landscapes, they definitely should. A former military base that’s located 200 miles from nowhere turned minimalist cultural haven where street tacos and fine dining coexist in perfect harmony. 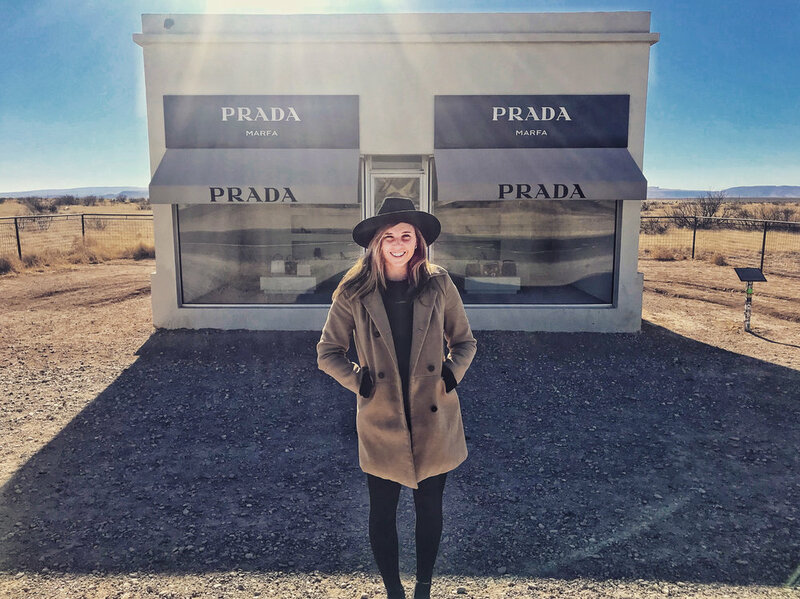 The Marfa Prada store is actually located in Valentine, Texas in quite literally the middle of nowhere. You can’t actually purchase the thousands of dollars of goods in the store, or even go in. It was created as a permanent art installation nodding to and criticizing a materialistic society. It was built with the intention that it would never be repaired, and eventually just degrade into the earth it stands on. The structure has been vandalized on multiple occasions, so you should go check it out while it still stands. There is also a mini Target out in the desert outside of Marathon if you’re looking for a more budget friendly photo. We stayed in a renovated Airstream we found on Air BNB (linked). This might have actually been my favorite part of the whole trip. Since I was a child I have ALWAYS wanted to own an RV. My parents weren’t exactly RV people so I spend my childhood in agony dreaming of the day that I could be the proud owner of a house on wheels. While I am not the owner of this particular Airstream, a little part of me still felt like it was a dream coming true. I’m not the biggest fan of minimalist art, but when in Marfa…. I actually really enjoyed the Chinati Foundation. The photo below is from one of Donald Judd’s installations is essentially hollow blocks of concrete in a field. It is even titled, “15 Untitled Works in Concrete”. Been to Marfa? Comment with your favorite experience!